~I sit on the park bench, feeling the coolness in the air. I watch my daughters disappear in and out of the maze of blue, red & yellow pipes, tubes and slides. The trees surrounding the sandy lot are just starting to put on their Fall coats. ~Just this morning I had watched the video; the interview with Ann, her voice quiet and gentle. And I had felt God speak to me, the tears coming up to my eyes. Slow. Still. These Mothering moments go by so fast. ~My heart longs to be Mary but my mind is all Martha. How many times am I with my girls but not "with" them? Sorting socks, stacking dishes into the cupboard. This business of running a business and a home has put my inner Martha into overdrive. And so I went looking for Mary at the park. ~It was just us girls as my Dear Husband was working late. 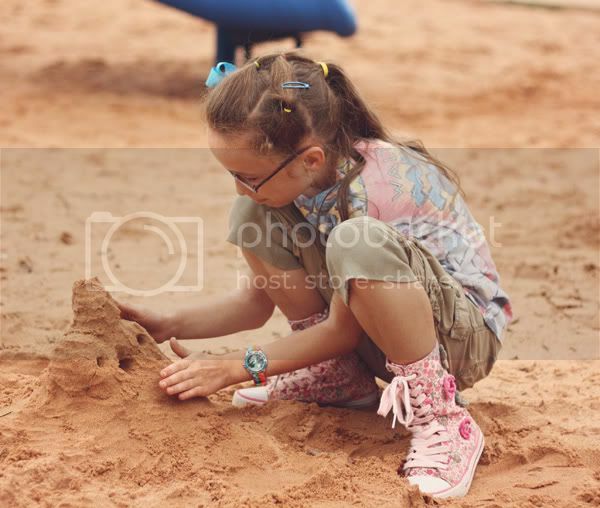 I watch my oldest dig her hands deep into the damp sand; patting, stacking, building a castle. She will be 10 soon. Every day she is growing more and more into a young lady. 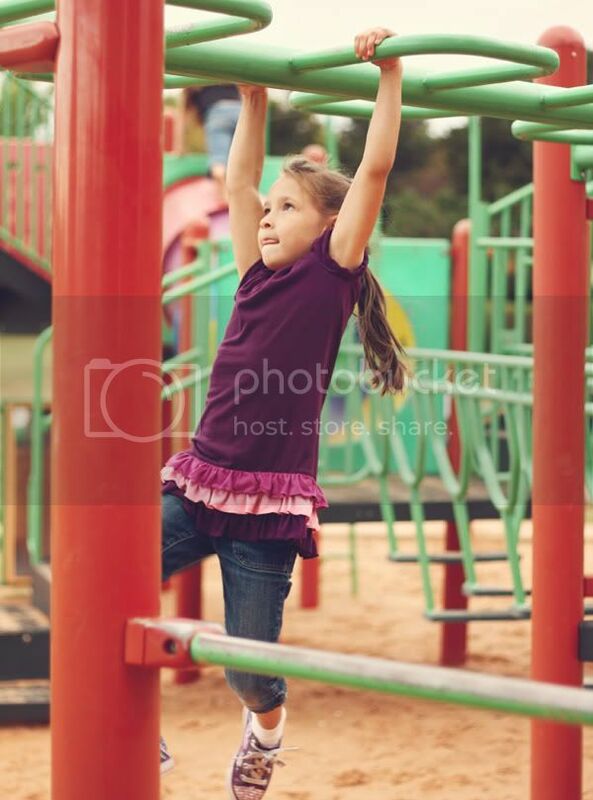 I watch my youngest; fearlessly swinging across the monkey bars. She is so brave. 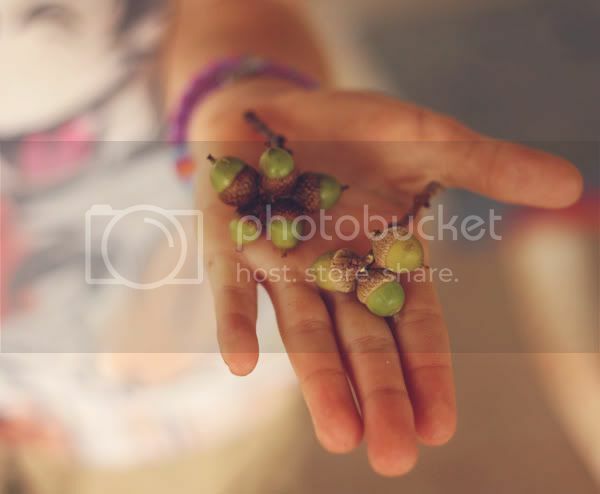 I try to press the images into my heart. Suddenly the bustle of the playground stops and all the little eyes turn towards the sky. The honking and squawking is a flock of geese and we watch their V-shaped line move across the pink sky. ~The air grows cooler and I load my girls into the car, listen for the click of seatbelts, and head home. As we turn west onto Warner Street we all catch our breath together. It's like a painting; vibrant colors splashed across the canvas. "Take a picture Momma! Oh! Take a picture!" And so we chase the sunset. Driving further west, turning onto side streets, looking for the perfect view. ~Finally, standing on a sidewalk downtown I try in vain to capture the shifting colors of the sky. I talk with my girls about how much God loves us. "Look at the beautiful things He makes just for us to enjoy!" A beautiful, full, radiant moon. This was almost too much! Too much gift for a stumbling, struggling Momma.